Chinese Christian women before 1919 have been largely invisible in the records of China missions and Chinese Christianity. With few exceptions we have known little about them either as individuals or as a group. 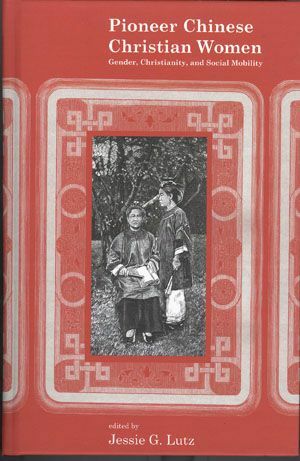 In this volume the contributors’ goal is to bring to light the life and work of these pioneer Chinese Christian women. The contributors have scoured a variety of sources in order to recreate the role of early Chinese women Christians in the church and in Chinese society and also to illustrate how gender affected their under-standing of Christianity and their career choices. How did the Chinese context alter their relations with the church and with both Christian and non-Christian communities? What was the legacy of pioneer Chinese Christian women? To provide context for this study, the work opens with an essay on women in imperial China, examining the ideal, the stereotypes, and the reality. Essays on Chinese Christian educators, doctors, nurses, and evangelists indicate the role of the missionaries and the church in making mobility and broadened horizons possible for women. They reveal also the contributions of these women and homemakers to a changing China. Chinese women before 1919, though a minority of church membership, were in many ways the mainstay of the church: the most faithful in attendance at worship services and Mass, responsible for teaching Sunday School, leading the choir, and organizing Bible study classes. They visited the sick, engaged in charity work, prepared the altar for services, and performed various other services. Many women followed their husbands in joining the church, but Roman Catholic Virgins, Protestant Bible women, and church workers were primarily responsible for evangelizing among women and children since Western male missionaries found it almost impossible to proselytize among women in Chinese society. Missionaries soon realized that establishing Chinese Christian families was essential to the stability and continuity of congregations, and Christian wives and mothers were vital to creating Christian homes and rearing children in the faith. Particularly during periods of persecution, such as the years from 1724 to 1846 and the recent era of the Anti-Rightist Campaigns and the Cultural Revolution, the Catholic Virgins and Christian families can be credited with the survival of Chinese Christianity. With liberalization during the 1980s many of these Christian families emerged as the basis for a growing Chinese church. The Christian church and Christian missions provided avenues for women’s social mobility as well. Missionary wives founded girls schools and eventually most central stations included a primary and secondary school for girls. Virgins and Bible women memorized or learned to read religious texts. Thus, a significant proportion of female converts attained literacy and, with this, new self-esteem. The first women's colleges prepared women for new careers and economic independence, while the establishment of hospitals opened up careers for women as doctors and nurses.